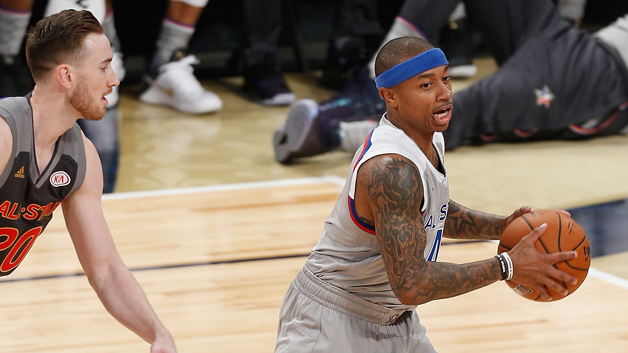 Brad Stevens gave Isaiah Thomas 19 minutes to showcase his abilities in the All-Star Game on Sunday night, and IT responded with 20 points. At one point, the 5’9″ guard got a little too cocky and went for a dunk contest dunk, bouncing the ball off the floor to himself to the amusement of his Eastern Conference teammates on the bench. He came up just short (pun intended) but recovered by hitting a three in the corner, because threes are worth more than dunks anyway. Now that All-Star Weekend is over, Stevens and Thomas have four days off before the Celtics take on the Raptors this Friday in Toronto.